Much of my focus and writings are spent discussing how to change how you look on the outside. It is easily argued what is more important are internal changes that influence your health. For me the discussion is not worth spending too much time upon as an approach to improve either one will also benefit the other. Therefore, it is more prudent to see which focus engages the mind and your motivation the most. I have been lucky enough to see many people come off their medications over the years. This has ranged from blood pressure to thyroid medication and various prescriptions for mental health issues. The key is working with your doctor so they are able to change your treatment schedule. There is a reason you are on them so something must change for a Doctor to be able to take you off them. To do this you have to help your doctor by helping your body. So many health issues are benefited from changes in your exercise, sleep and food behaviours. Changes in body shape also benefit a variety of health conditions. As you change the stimulus on the body you will change its internal functioning also. This means you may be able to change your medications if your doctor sees fit. The best way for this to happen is to ask your doctor what would they need to see to be able to think about changing their treatment plan. Then you must go out and deliver the health stimulus and see how the body reacts. With an ongoing open dialogue with your doctor you will see if your body is one that responds enough to reduce or eliminate prescription drugs. 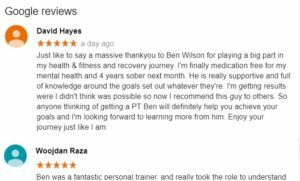 Photo – Review From My Online Client – David Hayes.